The road climbed fairly gently up a wide valley. There's a lake in the distance and there are mountains but its not really that spectacular, and looked like Wales in low cloud only a bit bigger. The pass was not as high as claimed, which is usual for these things, but it was certainly over 4000m. The descent was rough. We met a lovely old shepherd and his delightful sheepdog. After some horrible sandy track we reached tarmac, the great Pamir Highway. It was about 1 lane wide and had no traffic. There were no houses, nothing, just a line of telegraph poles. Far away in the distance we saw a figure, a man walking, coming towards us. We have no idea where he had come from or where he was going to. We crossed paths with him after a while, and that was it  we left him behind walking along the road and disappearing into the distance. He looked a little bit drunk. The weather was still low cloud. We were on a wide plateau with ranges of mountains all around but the cloud hid anything interesting. After a whole lot of nothingness we reached something. Alichur. Which looked quite nice from a distance  well, any human settlement would, even one called Alis Curse. Close up, its a desolate and deserted place mostly consisting of telegraph poles, and widely spaced low, square, half derelict houses. But like the sun suddenly breaking though the clouds, the place is transformed : a young woman greets us, shows us to the shop  which has Snickers  and says her family have a homestay. She's called Shahnoza. Her familys house is very basic, but she makes us very welcome. Alichur does have a pretty Mosque. We had read that the local sect in Ismaili, who are descended from the original Assassins, so-called because they went out murdering in a Hashish-induced rage, or at least thats what the propaganda against them alleges. These days it is rather different and they are into such things as horse racing and other than that they are rather like the Quakers, but, alas, without the Porridge. The Alichur plain isnt a great place for camping. 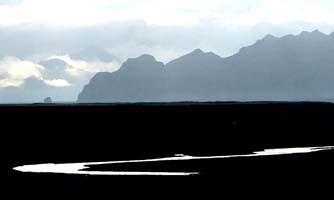 It is a wide and very windy plateau and there is not much in the way of water. There are yurts and there is a fish restaurant for Chinese lorry-drivers. To avoid camping you can try and flog the whole distance to Murghab in a long days ride, which we did; the ride isnt actually too gruelling despite incorporating a 4000m pass. Its a bit rich to claim this as a pass since youre starting at nearly that altitude and its really just the high point in the plateau. Nevertheless we felt it worth celebrating the summit with a Snickers  only to find the road drag itself up for another 5 metres. The surrounding peaks drew closer; red and swirly rocks. A convoy of Chinese lorries. Then a gradual descent in a wide valley, and over a crest above the Murghab valley. The green is astonishing, and a wide silver river snakes across a green plain. A convoy of teeny Chinese minibuses, driven across the border in a sort of caravan, the drivers racing up the climb. But the long ride was only the first part of the story for we now had to find ourselves somewhere to stay. The existence of guesthouses is confirmed in guidebooks, and we had a map, a neat and confident looking street plan within the Swiss-produced Pamirs map. However the roads on the map did in no way match anything we found on the ground; we could have done as well with a map of Timbuktu. The homestays are never signposted. After an hour of fruitless searching and an extra 10km ridden we resorted to asking random people  surprisingly, this is what does the trick. Murghab is essentially Kyrgyz rather than Tajik, the people are oriental looking, speak a Turkic language and keep to Bishkek time, an hour ahead of Dushanbe. I quite liked Murghab as there were tomatoes on sale there and Kyrgyz hats are stylish. The homestays arent too bad, if a bit optimistically priced. The Erali is on the high edge of town and has good views from a sunny lounge. The weather had made a number of abortive attempts to improve. It didnt try very hard on our rest day but this didnt interfere much with our planned activities which were Sitting and Eating. 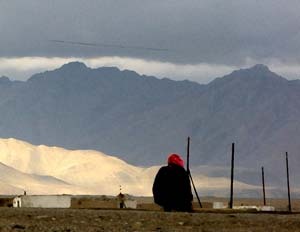 We did also go in search of information about the passability of the Bartang valley, which was not much of a success. We left town on my birthday. There are only 2 roads, the right one and the wrong one and we somehow got on the wrong one, the one that goes to China. Then we found another wrong one, and this one goes to a derelict airfield. I have had better birthdays, but also much worse ones. This time nobody stole our bikes, and we had Ukrainian Swiss roll in a pannier. We rode northeast through a plain flanked with mountain peaks, sort of following a river and gaining altitude imperceptibly. The weather slowly cleared, traffic had all but vanished, and for most of the day it was just us and the mountains and the marmots. Camping wasn't a problem, theres nobody here, you just put up the tent. We camped at over 4000m, with a fabulously clear sky, the night saturated with starlight. We crossed the high pass the next day, and this time it was a real pass, over 4500m, and the day was brilliant and cloudless. We crossed though snow peaks then the mountains drew back, we descended a rough section to a wide river valley, crossed through a small ridge, and into a vast plateau ringed by snowy ranges: Tajikistan and the borders with Kyrgyzstan and with China. It felt like a world suspended between known worlds. The road was dead straight for 23km, taking us to the shores of Karakul, a huge lake. The village on the shore was a windswept and sparse place, almost empty of people, rather surreal, rather di Chirico. We asked for directions to the shop, failed to find it, asked directions again from the same two men wed asked before  it felt suspciously like there were only 2 real inhabitants of the place who had to act as the entire population. The shop was indistinguishable from the other one-storey houses except that the door was open. A dog waited silently outside. Inside seemed empty, except for the sound of a radio  Chinese lute music  drifting from a room inside, and a shadowy figure of an old woman sewing. For the third time we asked for the help of the two men, they called to the woman and she opened up the store. Mostly of the stock was biscuits; we bought several days worth, enough to last the afternoon. Our route from there was several days reversing the way we had come. The original plan had been to return to Khorog via the Bartang valley. Its reputed to be difficult terrain, even without the lack of any human settlement at all on the way which means you have to carry a weeks worth of food. Wed heard in Khorog that the road at the far end was blocked by a landslide; we had no way of telling whether that meant it was impassable with bikes or not, but we couldnt risk it. 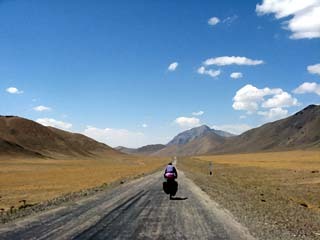 So we rode back to Murghab and back along the plateau. From Alichur the easy way back would have been to follow the highway back, but theres a more interesting alternative in crossing a pass to the Roshtkala valley, which lies between the Panj and the Gunt valleys. Not many cyclists have done it, though we wouldnt have been the first. We stayed with Shahnoza and family, and here caught up with Matt and Hélène (this trip was their honeymoon) who own a completely insane alarm clock.